A swimming pool is often an essential requirement when choosing the perfect property for your family holiday. Large hotels normally have great sized swimming pools. This allows all all their clients full enjoyment. When renting a holiday villa in Mallorca the pool is for your exclusive use. Once you have prepared a villa shortlist it is worth taking some time to compare the pool specifications. An average size pool in a private villa is approx. 8m x 4m. A pool size of 5m x 3m is obviously smaller and may not suit your requirements. The more people who will be using the pool the larger the pool should be. This ensures everyone is able to enjoy the facility. Size really matters! I would recommend taking a look at the 2 largest pools in our portfolio of holiday villas for rent. 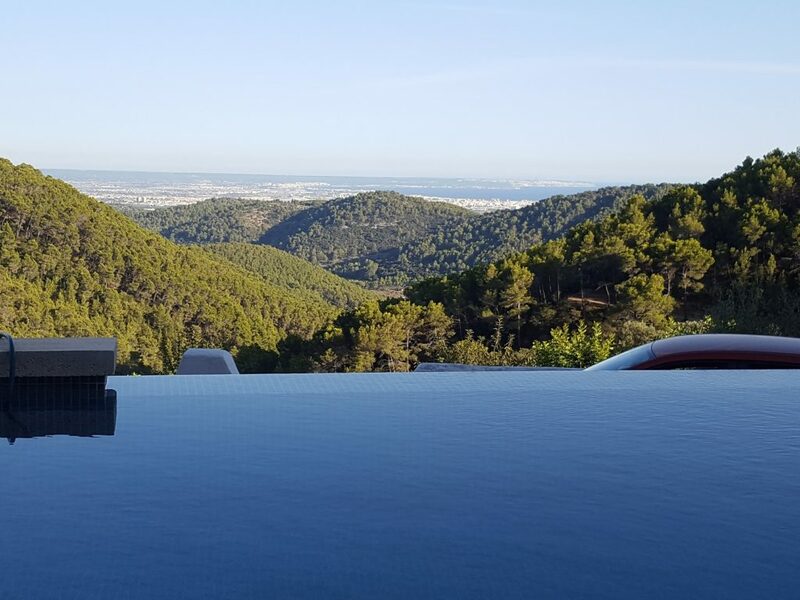 Villa Casa Paco and Villa Costa d´Ullaro are both located in Campanet, Mallorca and have larger than average pools. The latter has an impressive 14m x 8m pool! Infinity pools are very attractive. This is especially true when perched on a cliff edge overlooking the sea! An infinity pool should give the impression that it merges with the landscape. Infinity pools are not always the best option if you have young children. Villa Sofia in Esporles, Mallorca boasts a fantastic example of an infinity pool. It is always worth considering the ease of entry into the swimming pool. Aluminum step ladders are not suitable for everyone. Gentle Roman steps, into the shallow end are a perfect asset. Essential maybe if you are travelling with young children or elderly relatives. Some steps are wide enough to allow bathers to sit on them. Feeling the water lap over their bodies. Non swimmers really enjoy this experience. Villa Xisca just outside Alcudia, Mallorca, Casa Alexander in Puerto Pollensa, Mallorca and Villa Vinyas, just outside Binissalem, Mallorca have great examples of easy access into a pool. Roman steps into pool of Villa Vinyes Can Grau, Binissalem. Safety First is an important consideration when contemplating a swimming pool in your holiday villa. It is of particular concern to families with toddlers. A number of villas offered by Parasol Property Mallorca have secure fencing around the pool. Take a look at Villa Vora and Villa Costa in Puerto Pollensa and Costa d´Ullaro in Campanet which has the gated pool located some distance from the villa. I am delighted to offer the opportunity to hire secure safety fencing for your stay if you have concerns. The cost varies on the size and ease of installation. An average price is 240€ for a week. This would naturally need to be booked in advance. 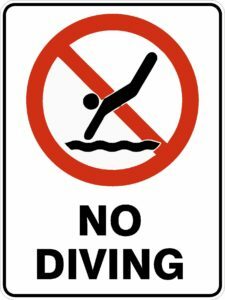 All pools should display NO DIVING signs and different pool depths should be clearly marked. It is important that this information is shared to all guests. Prefably on the first day of the holiday. Check out the POOL DEPTHS too. As a guide, shallow ends range from 0.30m to 1m. Deeper ends range from 1.5m to 2.5m. Finally, good POOL MAINTENANCE is essential. Pools have filters on automatic timers. These run for several hours daily to keep the water clean. A professional pool person will visit the property once or twice a week. Most private villas use one of two systems for pool cleaning. Chlorine tablets placed in the skimmers is the most usual. Recent years salt has become popular. Dissolved salt is placed into the pool and is turned into chlorine by electrolysis. The ph and chlorine levels of the pool will be analysed regularly. It is important to shower prior to entering the pool to remove excess sun tan oil or sand from the body. Remember that babies must always use swim pants. To avoid ear infections, children should be restricted from swimming under the water for too long. The ears are not prepared for this. There are ear drying sprays which can be purchased from the chemist. If the water in your pool becomes slightly cloudy or has a green tinge to it please report this immediatly so appropriate action can be taken as quickly as possible. I hope this information is helpful to ensure you choose a great holiday property with a perfect pool for your requirements. HAPPY HOLIDAYS!